it from the AC outlet immediately. comply with FCC technical regulations. operating instructions, and adhere to them. plug (a plug having a third pin for grounding). only one way. This is a safety feature. of the polarized plug by forcing it in. purpose, of the grounding plug. never be blocked or covered. cord exits from the appliance. and disconnect the antenna or cable system. due to lightning and powerline surges. for cleaning the exterior of the appliance. specified in the operating instructions. restore the appliance to normal operation. characteristics as the original parts. You can attach the optional tripod (VCTPCM1) to the recorder. recorder can be attached to the belt. recorder can be attached to your belt. When pressed briefly, switches folders. When pressed and held, displays the menu. Turns the backlight of the display on or off. Switches time information on the display. is connected to the  jack. connected to the LINE IN (OPT) jack. the artist name and title information. specified in the menu in the stop mode. recording mode of the current track. Displays the file name of the track. on both sides to pull it out. and  ends in the right position. read into the recorder’s built-in memory. power is indicated on the display. There is sufficient battery power. display; there is no power left. The recorder will not operate. the DC IN 6V jack. PLAY/ENTER button to fix the values. minute to start the clock. USB cable. Doing so may damage the data. ENTER button to fix the value. the clock” to reset the clock. The built-in microphones are unidirectional. records sound from the right. session of two or three people. pointing at the sound source. records sound from the left. of a large number of people. Use the MIC ATT switch. according to the sound sources. recording, go to the menu display (page 40). 5 Press the  REC button. use the peak meter to check the level. -12 dB (green):Distortion will not occur. than –1dB. Lower the level. Press the  STOP button. time is several tens of seconds. beforehand in order to write data more efficiently. portion will be recorded as a new track. the point where you want to divide a track. headphones, which have less sound leakage. press the  PLAY/ENTER button. The “PRE REC” display appears. ENTER button to fix the setting. 24) to make the recorder ready to record. point the button is pressed. seconds, the pre-recording function is disabled. 5, prerecording is done only for these seconds. microphones cannot be used for recording. recorder and record its playback sound. devices output copyrighted digital signals. cannot be recorded with the recorder. 4 Start playback on the external equipment. button where you want to start recording. Start playback on the external equipment. seconds, digital recording may be disabled. The “SYNC REC” display appears. 7 Start playback on the external equipment. continues as a new track. (RM-PCM1) to control recording operations. to the REMOTE jack of the recorder. use may not operate properly. play back, go to the menu display (page 40). Stick” in addition to the built-in memory. You can switch the memory as follows. Press the  PAUSE button. recorder will stop at the beginning of the last track. END” is lit to go back to the desired point. the desired point during playback. the recorder. For details, see page 38.
during playback or playback pause. MENU button to exit the menu mode. current position, press the STOP button. briefly to specify the starting point A.
specify the ending point B.
after they have been divided. Press the DIVIDE button again. “DIVIDING...” appears on the display. The “DELETE TRK” display appears. The “DELETE ALL” display appears. All the tracks in the folder are deleted. and “_1” is added to the name of the new track. maximum number of recordable tracks (page 51).  You cannot divide an MP3 file. the same as an existing file in the folder. hard disk drive of the computer. 1 Turn on the power of the recorder. is connected to the computer. and data may be damaged. * The 64bit OS is not supported. * The sleep mode of the Mac OS is not supported. this recorder with the Windows Media Player. PC via a USB connection. computer screen as shown below. Installation of the supplied driver is required. Install the driver using “SonyRecorder_Driver. and time, etc. Do not delete or change these files. Folder D shown in the figure. recorder can display the ID3 tag information. the ID3 tag information, “Unknown” will be displayed. 1 Connect the recorder to your computer. a “Memory Stick” is inserted in the recorder. the computer onto the recorder. one folder and up to 5000 tracks in total. to select the file that you want to play. settings using the menu display. and displayed in the center. 2 , the confirmation display will appear. and press the  PLAY/ENTER button. the menu display appears again. recording, you cannot operate the menu. operational status of the recorder. The indicators light up or flash. The indicators do not light up or flash. For details, refer to page 19.
and where the tracks to be played back are saved. 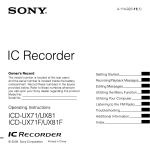 The built-in memory of the recorder is used. An optional “Memory Stick” is used.  “BUILT-IN” is selected automatically once the “Memory Stick” is removed. change the folder structure (page 37) to the default setting. Do not format the built-in memory or “Memory Stick” with your computer. You can delete all the tracks in a selected folder. For details about folder and track file structure, refer to page 37. You can delete one selected track. The setting cannot be executed when no optional “Memory Stick” is inserted. The function does not work when the remaining battery power is low. The function does not work when a track file is set to read-only. The function does not work when no track is saved in a folder. Please note that the data deleted cannot be recovered. the + setting and by 5% for the – setting. The easy search function does not work. When you press the  FF/ or  FR/ button, the recorder will move to the next or previous track. by pressing the  FR/ button. You can record for a longer time. You can record with higher sound quality. to that of a DAT, and 96 kHz is equivalent to DVD Audio. data it takes and the better the sound quality. quantifying bit number of 24 bits. 7) In digital recording, this function does not work. clipping that happens during digital processing if audio is over-input. When the LIMITER switch is set to “ON,” the digital limiter circuit operates. over 12dB is input. In this case, sound may be distorted. appears if the maximum peak value exceeds 0 dB. The super Bit Mapping functions to reduce noise. The super Bit Mapping does not function. integrated into the 16-bit data. Audio under 75 Hz frequency is not recorded. Audio under 150 Hz frequency is not recorded. press the  REC button and the recorder is in standby for recording mode. button is pressed (pre-recording function). the point where the button is pressed. The recorder supplies power to the connected plug in power type microphone. The recorder does not supply power to the connected plug in power type jack. 9) When recording analog input signals, this function does not work. “Memory Stick” are not guaranteed. the recorder so it contains no data. Open the cover of the Memory Stick slot. the left, and close the cover. “MEMORY” item of the menu. display, and the ACCESS indicator flashes. from the Memory Stick slot. and track files, see page 37.
audio data (tracks)” (page 31). Stick” inserted to a computer (page 36). track files are the same as those of the builtin memory (page 37). models of other makers may cause a malfunction. protection technology developed by Sony. The recorder does not support parallel data transfer. turned off during a read or write operation. to static electricity or electrical noises. thinner, etc., to avoid damaging the finish. If you experience trouble with your recorder, try the following solutions. to 53 to check your recorder.  The batteries are exhausted. Replace them with new ones (page 17).  The POWER switch is set to the “OFF” position. Set it to the “ON” position. equipment is connected for recording (pages 23, 28 - 30). to the recorder (page 19), or replace the batteries with new ones (page 17). recorder during recording so that noise was recorded. then format the memory (page 41). a mobile phone during recording or playback. dirty when recording. Clean the plug. playback or monitoring the recording sound. Clean the plug. corresponds to the sound source and connections (pages 23, 28 - 30).  Adjust the recording level to an appropriate range (page 24).  The sound source is too loud when recording with an external microphone. microphone away from the sound source. the microphone away from them. time noted on page 57.
remove the batteries or AC power adapter. memory, you cannot record tracks up to the maximum. depending on the number of tracks. shorter than the maximum recording time of the recorder. a malfunction of the recorder.  Select “MEMORY STICK” for the “MEMORY” item of the menu. recording. 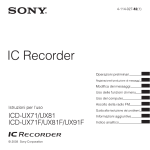 Initialize the memory using the recorder. details, see the specifications (page 54). The clock is not set. Set it before operating the recorder (page 19). the menu display, and then set “SBM” again (page 43). 35), or store some of the tracks on your computer (page 36). your computer (page 36), and then erase the contents of the memory. recorder. Use a “Memory Stick” that the recorder supports. that the recorder supports (page 45). You cannot delete the track that is set to “Read-only” on the computer. or a file of a different format. It cannot be played or recorded on the recorder. played or edited on the recorder. There is no track in the selected folder. connect the AC power adapter to the recorder (page 19). from the optical cable connected to the LINE IN (OPT) jack of the recorder. Stick” may have a problem. 41). Do not format the memory using your computer or other equipment. The batteries are exhausted. Replace the batteries with new ones (page 17). (see the warranty for contact information). malfunction. Use only compatible batteries and AC power adapters. the file name using a computer. same file name in a folder. “.WAV” file is created for each recording. structure, refer to page 37.
stopped right after recording is started. more, they are displayed in lower case. the recorder cannot recognize the folders. be saved in one folder is 99 tracks. The total maximum recordable time (approximate) of all the folders is as follows. * The maximum recordable time varies depending on recording conditions.